I constantly admire the Irish ability to make great sport and entertainment out of minimal resources. 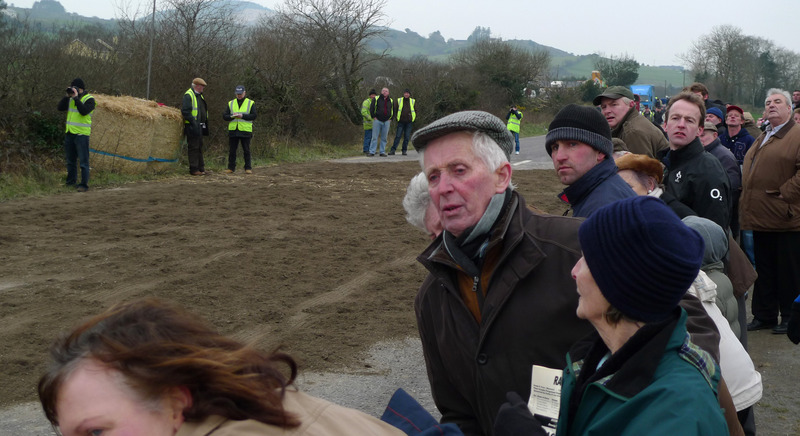 A case in point was the Road Bowling which I described in a previous post and a further example is our Sunday afternoon spent at The Races: not in a big grandstand at a famous course, but at a closed-off section of the R586 – the main highway connecting Bantry to Drimoleague and Cork. 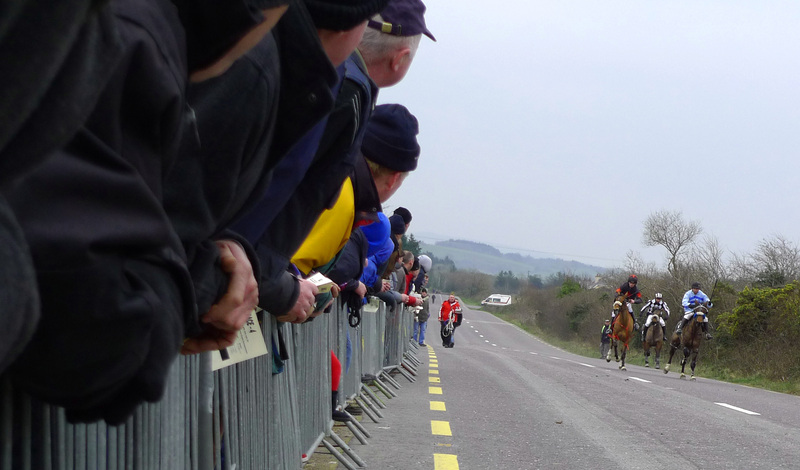 Through traffic takes second place, having to negotiate a diversion of narrow, bendy lanes in order to allow The Racing to use a half mile long section of fairly straight and level road (horse racing in Ireland is still measured in ‘miles’). 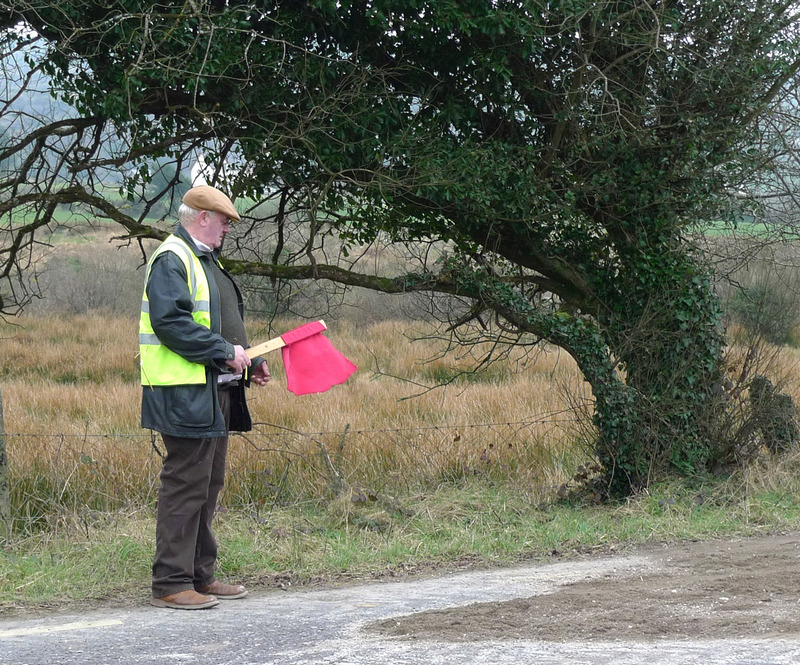 Except when the Cork – Bantry bus comes through, when everything has to stop and move over. Horse racing goes back thousands of years, and the Irish have always been good at it: Irish trainers, horses and jockeys dominate many of the big events in Britain. 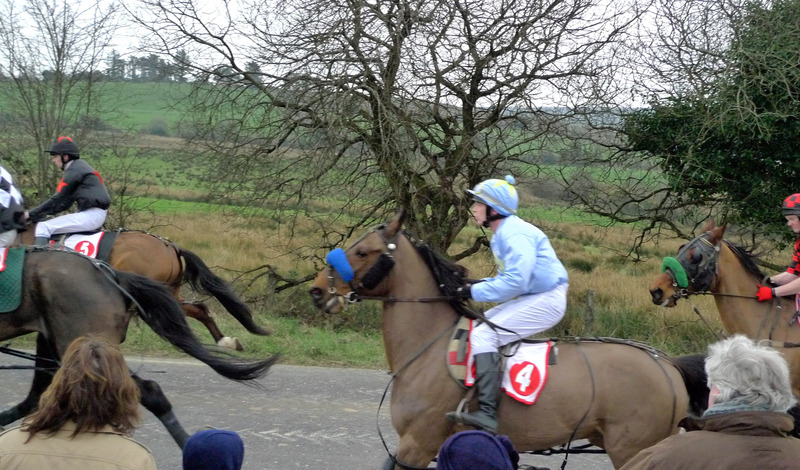 I was fascinated to learn that it is a non-sectarian sport in Ireland: it is governed in the Republic and in Northern Ireland by one body: Rásaíocht Capall Éireann. The British Horse Racing Authority has no jurisdiction in the North. 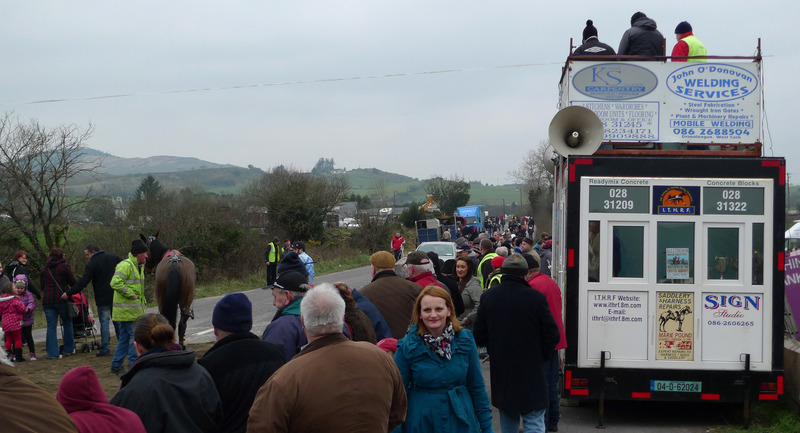 The proceedings were controlled at a trailer from which a commentary was broadcast through a pair of loudspeakers. Cups for the presentation after each race were handed out through the door, while a man in a yellow jacket and a white flag was responsible for starting each race – a tricky affair, as horses and riders were seldom in one place at the same time, and didn’t stand still in any case. Another man had a red flag, and I believe his job was to signal a faulty start. All the spectators congregated at one end of the half mile stretch of road, so we only saw the start and finish of each race. Races were either over one mile or two, and at either end of the course all the riders had to make a 360 degree turn around some large bales of straw. All this looked rather chaotic. The beginning of March has brought a very cold spell, and our hands and feet were suffering by the time the modest crowd began to disperse. Today’s event has given me a taste for the Sport of Kings, and I’m on the lookout now for some Harness Racing. This entry was posted in Irish History, West Cork and tagged Harness Racing, Horse Racing, Road Trotting, Standardbreds, Trotters and Pacers. Bookmark the permalink. I enjoyed reading about this Robert (and also the road bowling)–so local, unpretentious, community-involving. The closest in spirit I can think of at the moment in Canada are the fall fairs, but I’ve never heard of a horse race that takes over the roads! On the non-sectarian Irish sport, you will find that apart from soccer, all major sports eg gaa (naturally), rugby, golf, hockey, boxing and horse racing are all run on an all-ireland basis. 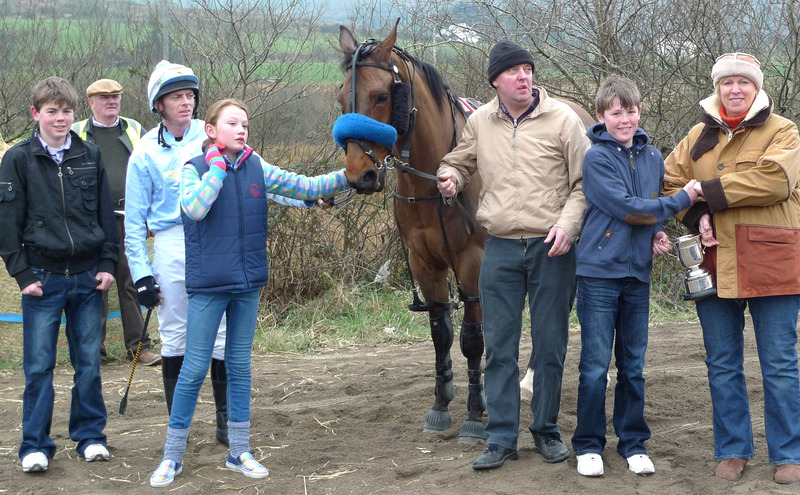 I really enjoyed reading this post and look forward to going to the races with you one day! Did you put a bet on dad? Sorry Phoebe – we only saw the bookmaker as we were leaving! Next time….